Back in the 1880’s and 1890’s there was a bicycle “craze” all around the World, and Halifax was no exception! There was a bicycle club; the “Halifax Ramblers” that cycled on high wheelers and pneumatic safeties. Many rides commenced at the Public Gardens on Spring Garden Road and went to Point Pleasant Park for evening rides, or perhaps to “Princes Lodge”, on the shores of Bedford basin which served as their club house. Swimming and lobster boils in a very social atmosphere was the order of the day. Yes, the “wheel” was the great equalizer as this served both males and females alike. This was an era which predated the automobile; many clubs had a military appearance, complete with uniforms, buglers and flag bearers! The Ramblers numbered well in the hundreds. The “wheel” was the rage; there were over 100 hotels in NS, as well as the railway that offered discounts to secure business. Cyclists opened up touring in NS. 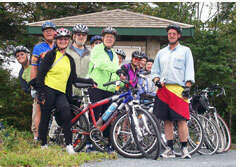 In the HRM, there are wonderful bicycle clubs covering many areas of cycling. There are distance clubs, racing clubs for both road and mountain bike disciplines, touring club, MS Bike ride training groups, as well as a number of fitness clubs that use cycling as a component. As a group, we would estimate the above would represent less than 20% of all the people who own a bicycle. What about the other 80%? In 2007, in taking advantage of the beautiful HRM Trails, we started the “Halifax Ramblers Bicycle Group”, and scheduled 30 trail rides from June to October. We like the mindset of the old Ramblers club and the social aspect, hence named it the Ramblers to honour our past. The 2007 Ramblers were a group of like minded cyclists, meeting on a show and go basis; there was no structure, membership, dues, leaders, etc. By the last ride in October we were getting sizable turnouts; we was thrilled with the progress of some of the attendees. We “polled” a number of the attendees for feedback in a number of areas – all wanted a bigger and better Ramblers, while retaining the slow paced, moderate distance and very social rides, and offering road and car / camping touring opportunities; and at an affordable price. Based on increased risk of sharing roads with traffic it was decided to form a club. There has been a lot of thought put into designing the tour schedules, in keeping with meeting the goals of the Ramblers. We have selected wonderful, scenic trails; many are abandoned rail beds, while others are cycling gems, picked because of vistas and gentle terrain, by Maritime standards. We changed our name to the Nova Scotia Ramblers to reflect the many out of town rides, as well as the expanded membership base.